The battle of Marathon is one of history's most famous military engagements. It is also one of the earliest recorded battles. Their victory over the Persian invaders gave the fledgling Greek city states confidence in their ability to defend themselves and belief in their continued existence. The battle is therefore considered a defining moment in the development of European culture. In September of 490 BC a Persian armada of 600 ships disgorged an invasion force of approximately 20,000 infantry and cavalry on Greek soil just north of Athens. Their mission was to crush the Greek states in retaliation for their support of their Ionian cousins who had revolted against Persian rule. Undaunted by the numerical superiority of the invaders, Athens mobilized 10,000 hoplite warriors to defend their territory. The two armies met on the Plain of Marathon twenty-six miles north of Athens. The flat battlefield surrounded by hills and sea was ideal for the Persian cavalry. Surveying the advantage that the terrain and size of their force gave to the Persians, the Greek generals hesitated. One of the Greek generals - Miltiades - made a passionate plea for boldness and convinced his fellow generals to attack the Persians. Miltiades ordered the Greek hoplites to form a line equal in length to that of the Persians. Then - in an act that his enemy believed to be complete madness - he ordered his Greek warriors to attack the Persian line at a dead run. In the ensuing melee, the middle of the Greek line weakened and gave way, but the flanks were able to engulf and slaughter the trapped Persians. An estimated 6,400 Persians were slaughtered while only 192 Greeks were killed. The remaining Persians escaped on their ships and made an attempt to attack what they thought was an undefended Athens. However, the Greek warriors made a forced march back to Athens and arrived in time to thwart the Persians. "The Athenians were drawn up in order of battle in a sacred close belonging to Heracles, when they were joined by the Plataeans, who came in full force to their aid. Miltiades by these words gained Callimachus; and the addition of the polemarch's vote caused the decision to be in favor of fighting.'" Miltiades arranges the Greek line of battle so that it stretches the length of the opposing, and far superior, Persian army. Then, much to the surprise of the Persians, he orders the Greek warriors to charge headlong into the enemy line. "The Athenians...charged the barbarians at a run. Now the distance between the two armies was little short of eight furlongs [approximately a mile] The Persians, therefore, when they saw the Greeks coming on at speed, made ready to receive them, although it seemed to them that the Athenians were bereft of their senses, and bent upon their own destruction; for they saw a mere handful of men coming on at a run without either horsemen or archers. Such was the opinion of the barbarians; but the Athenians in close array fell upon them, and fought in a manner worthy of being recorded. They were the first of the Greeks, so far as I know, who introduced the custom of charging the enemy at a run, and they were likewise the first who dared to look upon the Persian garb, and to face men clad in that fashion. Until this time the very name of the Persians had been a terror to the Greeks to hear. The two armies fought together on the plain of Marathon for a length of time; and in the mid-battle the barbarians were victorious, and broke and pursued the Greeks into the inner country; but on the two wings the Athenians and the Plataeans defeated the enemy . Having so done, they suffered the routed barbarians to fly at their ease, and joining the two wings in one, fell upon those who had broken their own center, and fought and conquered them. These likewise fled, and now the Athenians hung upon the runaways and cut them down, chasing them all the way to the shore, on reaching which they laid hold of the ships and called aloud for fire." "...the Athenians secured in this way seven of the vessels; while with the remainder the barbarians pushed off, and taking aboard their Eretrian prisoners from the island where they had left them, doubled Cape Sunium, hoping to reach Athens before the return of the Athenians. The Persians accordingly sailed round Sunium. But the Athenians with all possible speed marched away to the defense of their city, and succeeded in reaching Athens before the appearance of the barbarians...The barbarian fleet arrived, and lay to off Phalerum, which was at that time the haven of Athens; but after resting awhile upon their oars, they departed and sailed away to Asia." Herodotus's account appears in: Davis, William Sterns, Readings in Ancient History (1912); Creasy, Edward, The Fifteen Decisive Battles of the World (1969). 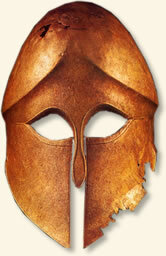 "The Battle of Marathon, 490 BC," EyeWitness to History, www.eyewitnesstohistory.com (2006). 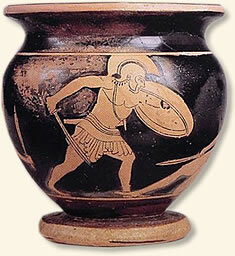 According to legend, a runner was dispatched to inform Athens of the victory after the battle. The runner - Phidippides - made the run in three hours but died after delivering his message. His effort is commemorated in the modern-day marathon included in the Olympic Games.